Eddy Cherki and Michel Wieviorka's account of the workers' self-reduction of prices movement in the Italian city of Turin in the 1970s. To consider the new developments in social struggle within Western Europe since 1968, one must turn to Italy. The organization of the worker's movement, often on a mass scale, has assumed original forms. Urban struggles have led to organized union and political neighborhood actions with stakes tied to consumption. From this point of view, the autoreduction movement, which began in Turin in the fall of 1974, constitutes a development of the utmost importance. Autoreduction is the act by which consumers, in the area of consumption, and workers, in the area of production, take it upon themselves to reduce, at a collectively determined level, the price of public services, housing, electricity; or in the factory, the rate of Productivity. Above and beyond the "classical" forms of economic crisis and the bankruptcy (or rather absence) of the Italian government's economic policy, the most enlightened sectors of the technocracy and certain leaders of the large Italian monopolies (such as Agnelli, FIAT), centered around Carli, president of the Italian bank, propose and, in June 1974, compel the government to accept a plan of reform, the Carli Plan. Founded on the fundamental hypothesis of the tacit sup­port of the I.C.P. <fn> libcom note: Italian Communist Party </fn>, or at least its neutrality, this plan proposes two essential objectives. On the one hand, restructuring the production (diversification of some in­dustrial sectors, notably the automobile industry, formulation of a nuclear energy program) and, on the other hand, reducing, in the area of consumption, public ex­penditures - in particular, curbing the production of collective toots and ar­rangements (equipements collectifs). On a more general level. the Carli Plan seeks to place the burden of the Italian economic reform on the working classes by reducing internal demand, thus household consumption. Concretely, the govern­ment's principle of "fair pricing" of public services entails a massive price in­crease in transportation, electricity, telephone, health care and housing. In July, besides a few amendments proposed by the I.C.P., the Assembly approved this program with increases exceeding 50 per cent. The application of the Carli Plan presupposes a climate of social peace and the absence of workers' struggles. However, in the past few years, social struggles are on the rise. Classical forms of action have been significantly supplemented by less conventional forms: sabotaging production, sequestering leaders, lowering productivity, controlling the rate of production, and massive absenteeism. This movement expresses at one and the same time the rebellion of the Italian working class and its pugnaciousness. The metallurgical unions (the F.L.M.) and various groups of the extreme left ("Lot­ta Continua", "Avanguardia Operaia", and later (Il Manifesto") take an active role in this movement. Between 1968 and 1975 forms of direct action reappear on the battleground of urban struggles, they are essentially centered around the problem of housing. The homeless take over empty houses. Public housing tenants autoreduce rents or resist eviction. These struggles are illegal, massive and often violent. Massive struggles: in Italy between 1969 and 1975, twenty-thousand habitations are "squatterized". Rent autoreduction was the first form of action; the political objective was to limit rents to 10% of one's salary. These violent struggles cannot be isolated from the climate of social and police violence which reigns in Italy. The most dramatic episode occurred in the San Basilio neighborhood (in the suburbs of Rome). In September of 1974, a militant of the extreme left was killed during a clash between police and squatters. It is difficult to establish a direct connection between urban struggles and workers' struggles. It is not easy to grasp that the capitalist system in general is under attack in both the areas of production and consumption. The autoreduction movement in Turin strives in to unite through a collective action the forces of pro­duction and those of consumption. Each day, in Turin, tens of thousands of workers commute (pendolan). This con­stitutes a forced extension of the work day and an important financial burden. Some businesses allow their employees travel expenses; others provide for the transportation for their work force; but often, as is the case of FIAT, transporta­tion costs are directly born by the workers. In the summer and fall of 1974, the decision of two private transportation com­panies to increase their fares by 20% to 50% caused an immediate reaction on the part of the workers. The smallest companies refuse the money, then quickly reverse this decision. They threaten to curtail certain lines in retaliation. Worker's demonstrations and pressure from FIAT leads the regional government to demand that the concerned companies accept suspension of their curtailments and operate buses at the old price until an agreement with the unions is reached. The fact that a direct action resulted in such rapid success is of utmost impor­tance, if only on the level of the debate within the unions and leftist organiza­tions. We are no longer in the factory, in the production area itself, but rather at the junction of the factory and the neighborhood or town. This foreshadows the development of popular struggles at the level of consumption, without yet presen­ting the most characteristic traits (pluri-classism, difficulty in relating to factory struggles). Last and above all, this form of struggle constitutes a break from traditional practice. Autoreduction was not practiced by isolated militants: it was organized, and this is a fundamental point, by unions which brought their active support and simultaneously imposed a coherent line of action. Such a position would have been unthinkable a few years earlier: it strongly suggests a breakthrough, of cer­tain themes of the extreme left. We should, however, assess the scope of this breakthrough: the autoreduction of regional transportation has always been a localized phenomenon involving merely the machinery of local metallurgical unions, for a set objective. At no time was it a question of generalizing the move­ment on a national scale. The movement on electricity, instigated by the provin­cial leadership of the FLM will give a new dimension to autoreduction, its truly mass character. Taking advantage of the summer and in the context of the Carli Plan, the govern­ment, at the beginning of July, decides to increase the electricity rates. This in­crease anticipates an entire series of comparable measures and, as a result, con­stitutes a political test for the authorities. They will be able to impose the follow­ing increases (telephone, public transportation, etc.) all the more quickly and easi­ly if the reaction to their first decision is weak and indecisive. The unions must act, and act fast. In an economic crisis, the struggle in the factory cannot serve as a basis of mobilization for meeting demands related to consumption. The unions of the C.I.S.L.-electricity, using the example of the regional transportation movement, then propose to initiate an autoreduction. Will the bills that the customers receive be reduced by 50% or, more radically, will a refusal to pay the bills be organized? In fact, this last solution risks being turned against those who use it: various past experiences have failed. In addition, this form of struggle does not oblige the workers to organize themselves. Simply asked to not settle their bills, the workers remain passive. Autoreducing the electricity rates signifies the customers' disagreement with the unilateral decision taken by the government in July. Direct action should force the government to negotiate and thereby determine, the level of demands around which negotiations can take place. The union members set this level at 50% of the new electricity rates. The union members thus instil an illegal dimension of "civil disobedience" to the action. In initiating this struggle, the unions play a determining role. From the ear­ly days, the electricity unions declared that they would refuse to turn off the elec­tricity in the apartment buildings practicing autoreduction no matter what. Moreover, they were ready to warn the tenants so that a mobilization to prevent electricity from being turned off be unleashed. The important fact to note is the role of a worker's union in initiating struggles outside of the factory. The workers' unions have come to somewhat replace parties or political organizations. Union initiative can only be understood if one considers the relations of power between the local regional level and the national level of the confederations. In­deed, there is a specific context of unionism in Turin. The unions of Turin, CGIL, CISL, UIL, and the union of FLM unions are relatively autonomous in relation to their national leadership. The CGIL in Turin, directly tied to the I.C.P. on the national level, is situated to the left of its national leadership; CISL is an "open" union in which militants of the extreme left defend their political ideas and obtain positions of responsibility on the regional level. This would not be the case elsewhere, notably in Milan where the unions' regional leadership, has curbed the autoreduction movement on electricity initiated by ex­treme leftist groups, or also at Naples where the autoreduction movement is more spontaneous and unconnected with any union initiative. The active support of the union initiative by the entire extreme left in Turin constitutes an important point; the movement would never have been able to organize the neighborhoods in the C.P. and the extreme left, with the different grass root neighborhood organizations, had not supported the union's initiative. The actual struggle will unfold in two stages. In the first stage, a campaign to col­lect signatures of commitment to the autoreduction position is initiated in the factories, then very quickly. in the neighborhoods. Why this campaign? Because it is necessary to move fast and give a mass dimension to the struggle. The petition allows the unleashing of an immediate and collective action: the signer has committed himself to paying only half price and to sending to the administration, together with his payment, a letter in which he explains that he is acting in accor­dance with the directions of the unions in Turin: CISL, CGIL and UIL. The second phase deals with the actual settling of bills. At this stage, the elec­tricity unions intervene, as expected, by furnishing a complete account of the dates when the bills were mailed, neighborhood by neighborhood. As a result of this accounting, the grass root organizations set up pickets in front of certain post offices and distribute to the workers a leaflet which explains the methods of autoreduction. The workers settle the autoreduced bills by using drafts prepared by the unions or the struggle committees. In Turin, and in Piedmont, within a few weeks, about 150,000 families thus autoreduced their electricity bill. For the most part, these are working class families and also families of the petty bourgeoisie - the famous middle classes - and they confer on this mass struggle a real pluri-classic dimension. However, the movement under this massive form remains very distinctly limited to Piedmont. In the rest of Italy, there will be several tens of thousands of autoreduced bills, in Tarento, Varese, Milan and Rome. For Milan and Rome, the non-extension of the movement is directly linked to the "curb" imposed by the leadership of the na­tional unions (and indirectly by the political parties, in particular the LC.P.). In Milan, the isolated extreme left, nonetheless, succeeds in reducing around 10,000 bills. The conjunction of a leftist unionism relatively autonomous in relationship to the confederations, of an extreme left capable of putting pressure on the unions and on the grass root organizations functioning at the neighborhood level, and the local support of the I.C.P. : the situation in Turin favored the development of this movement. But the specific character of the union's political situation in Turin is also at the root of its isolation: if the movement in Turin has instigated movements of a similar type in Italy, as well as an important debate, it has never been able to amalgamate ideological and political forces capable of imposing the autoreduc­tion initiative as a form of action that the leaders of the national unions and the parties could ratify. Rapidly polarized by the hostility of the LC.P. and the reservations of the unions' leaders, the debate, on the national level, opposes supporters and opponents of autoreduction. When the LC.P. takes a position on the autoreduction movement, it does so in order to criticize the bold character of this form of struggle, which in no way con­stitutes a form of working class action (central thesis, and its variant: workers don't break the law). The only adequate form of worker struggle is the strike. Other types of struggle can only be led and exploited by the extreme left, either explicitly or under its union "cover" (the CSL in Turin or Milan). The hostility of the LC.P. in relation to the autoreduction movement is supported by a line of argument based on the notion of the State and of "public service": autoreduction and the ideology of civil disobedience that it can generate on a mass scale contribute to accentuating the State's disintegration and the crisis of its institutions. In a political context where any action of the right tends to weaken the State (the strategy of "tension" advocated by the Italian extreme right), such a movement, on the ideological level, can only contribute further to its weakening. There is no doubt that autoreduction contains the seeds of a serious criticism of a public service (or of a State) allegedly neutral, technical, serving everyone, without political or ideological connotations. In fact, the I.C.P. 's willingness to manage the economic crisis articulates, on the political level, the strategy of the Historical Compromise. The co-management of the crisis and the participation in power together with the Christian Democrats cannot be organized by the LC.P. in a context of increased social struggles. The growing movement of civil disobedience is undoubtedly link­ed to the negligence of the economic policy of the Italian State, and to its decomposition. The strong reticence of some confederations and the I.C.P. 's disagreement isolate more and more the Turin militants as the date of the second wave of autoreduc­tion approaches (the first bills are expected in mid December). The political context is much less favorable than at the beginning of October. A new center-left government seems ready to settle the question by trying to negotiate as quickly as possible. The economic crisis is at its strongest. Fiat has just put a large part of its workers on technical unemployment. The union leaders begin negotiating' with the government in this context. The na­tional confederations are eager to settle the matter. In Turin also many fear the exhaustion of the movement. By signing the agreement, the union confederations accept the repayment of the autoreduced part which exceeds the balance agreed upon. Each component of the movement then draws its own conclusions from the struggle. An internal debate on the political perspectives opened up by this type of struggle takes the place of the opposition between the supporters of autoreduc­tion and its opponents (the LC.P. ), or those more reticent (the unions' leaders). One can derive several political and theoretical lessons from the autoreduction movement in Turin. The autoreduction movement opens up the old alternative between urban struggles (secondary front), subordinated to factory struggles, and the autonomy, if not the isolation of urban struggles led exclusively by the extreme left. It demonstrates the possibility of a coordinated struggle, the first concrete ac­complishment of the theoretical and practical intuitions of extra-parliamentary groups. It is the workers' unions who decisively guaranteed this coordination, because they took the initiative and contributed organizational support to the movement. 1) the specificity of Turin, a working class city whose life style is profoundly in­fluenced by FIAT, and the struggles which are conducted therein. 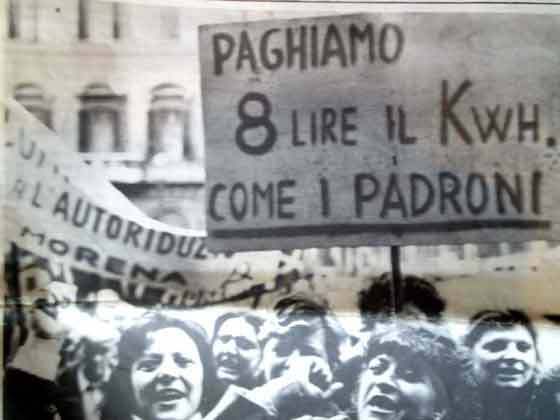 2) the strong tradition of intervention on the national level in social struggles by the Italian unions. It is expressed, for example, in the national workers' strikes on the problem of housing (in 1969) or in the support of the FLM for numerous oc­cupations of empty houses. The unions are no longer retrenched in a political-symbolic support of the workers' movement in urban struggles. They organize them directly on a precise objective. Indirect union intervention gives way in Turin to a direct involvement in social struggles which permits a considerable enlargement of the urban move­ment. Finally, the context of the economic crisis assumes a fundamental importance: during a period of overproduction, unemployment or threatened unemployment, the usual defences of the working class lose their sting; it becomes harder to en­force strikes, a refusal of regulated work pace, the struggle against an increase in productivity. To keep one's job and to defend salaries become the main thrust of factory struggles. Attacked by both strong inflation and massive increases in public services, worker's salaries cannot be successfully defended by actions within the factories. Fighting for salary increases is no longer sufficient, to de­fend one's threatened purchasing power requires struggling in the area of con­sumption. The struggle to defend one's purchasing power can be developed on a mass scale. Employees, civil servants (breaking with the ideology of public service as "neutral" and external to conflicts), teachers, etc. have participated in the auto­reduction movement on electricity. A pluriclassism constituted by the initiative of workers' unions and on the basis of direct action (autoreduction) was only previously practiced by active minorities. It has now become one of the most im­portant characteristics of this struggle. Autoreduction almost always directly puts into question the State and public in. situations. Popular control of so-called collective consumption, a "political" pric­ing for public services, goes against the policy of "fair pricing" put forth by the Carli Plan. Autoreduction is much more difficult to apply in the private sector. The repressive machinery moves at once to defend private property. Two examples: Marxist-Leninist militants initiated autoreductions on products sold in supermarkets in Milan. Result: the police intervened without delay jailing the militants. The second example is the occupations of empty houses: the repression is rarely immediate or brutal when it involves public apartments. The occupation of privately owned housing prompted on the contrary immediate repression. Autoreductions developed for the most part in sectors controlled by the State- a State in crisis, incapable of managing its own contradictions. The development of this movement could only accelerate the disintegration of the State. Its rein­forcement required the intervention of an ensemble of forces concerned with the re-establishment of economic order. Text from www.classagainstclass.com. Slightly edited by libcom.org for accuracy.